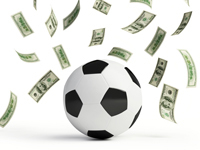 Make more money from your youth sports accounts and book more leagues. Idea #1: Sell Plaques! Build memory-mate and player plaques in to packages and you will make HUGE PROFITS. leagues you will make more money from plaques than pictures. We have seen 300 kid leagues where 200 kids have purchased a plaque. That is $2,000 in extra sales and plaque sales DO NOT hurt sales of photo items like trader cards, etc. Idea #2: Use low cost novelty items like key-chains as a bonus for ordering a high margin product like trader cards. For example, ONE FREE KEY CHAIN WITH EACH ORDER OF TRADER CARDS! This give-away will cost you pennies compared to all the extra profits you will make. Idea #3: Sell at least one item cash and carry on the job. Pennants are a great impulse item that we do not recommend to be put on order forms since they compete with higher margin plaques and are hard to deliver without damage. Instead, sell them cash and carry for $5.00 and we promise you will get tons of impulse orders. Only do this if you know how to "hustle" them, not if you just plan to leave them under a table and hope someone sees them. Show them to the kids as the come up and they will get their parents to buy, buy, buy! Idea #4: Instead of offering cheap memory-mate frames, feature fireball frames in your bids to blow away your competition. Many companies perennially offer the same low budget cardboard frame. Send out your bids with a fireball frame and you will set yourself apart. Hey if you want the low budget cardboard frames, keep in mind that we sell those too. This is just a way to set yourself apart for just a few pennies more.